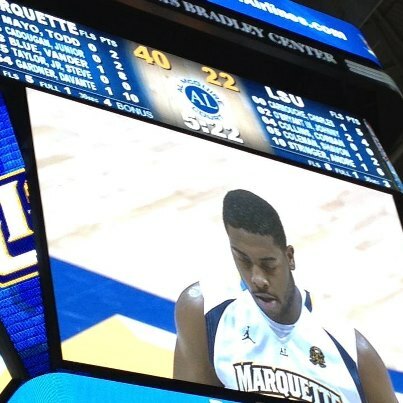 I’m not sure if MU fans realize what they saw Saturday when MU hit 24 of 25 free throws to beat LSU 84-80. The 96% from the line is the best Marquette has shot in 409 games this century (since the 2000-2001 season began). It is very rare for a team's free throw shooting to change who wins or loses the game, but the was not only the greatest shooting percentage of the century but MU did it in a game in which MU would have LOST the game with average free throw shooting of 17 of 25. The team was led by a 9-9 performance by 6-foot-8, 270 pound Davante Gardner. There are 49 players 270 pounds or bigger in D1 basketball, and they average 56% from the line and Davante’s 81% for the season makes him the only of these 49 above 75%. Overall, D1 players average hitting 69% of their free throws, so every time a player hits a free throw he “adds” .31 points above what was expected, and every time he misses he takes .69 off the board (see end of this points for the very advanced calculations for 1-and-1 front ends, offensive rebounds etc., but this basic formula is close). On Saturday, the team shot even better than Steve Novak did for his career. Novak made 63 more shots that an average player would have when he went 243 of 261 (93%) so for his career. The rest of MU's players this Century have combined for a 71% mark from the line, so with Novak MU has shot three percent better than the average team of the century resulting in 252 more points in 13 seasons than would be average. So MU's overall 72% from the line beginning in 2000-2001 means instead of scoring 29,799 points in those 409 games, MU has scored 30,031. However Saturday was the first time MU had ever hit 96% from the line in the 344 games in which they got to the line at least 15 times (the average team goes 14 of 20 or 14 of 21 on a given night, so below 15 attempts is very low). The only two times MU ever shot this high a percent previously was in two losses in which MU rarely made it to the line (12-12 against ECU in 2003 and 7-7 against UAB in 2005). A point I always stress is how very rare it truly is for free throw shooting to be the difference in a game. Teams are going to usually shoot fairly close to 69%, and unless it’s a one or two point game, getting to the line and the other three factors (field goal shooting, offensive rebounding and turnovers) are more important than the slight fluctuation of a point or two in scoring based on how well you shoot while there. However, on Saturday MU scored 7 points MORE than they would have with average (17 of 25) shooting, so they would have lost 77-80 rather than winning 84-80. Below are MU’s best 20 and worst 10 free throw shooting performances of the century and in 26 of those 30 games the great or terrible free throw shooting did not change the winner of the. The only other times besides Saturday that it did were the 19-20 outing against Missouri during the Final Four run of 2003 when MU would have lost in regulation with average free throw shooting, the 79-76 win in 2010 vs. Cincy which MU would have lost without 16 of 17, and on the flip side 63-61 loss at South Florida when MU would have won 61-57 with average free throw shooting. Of course 1 or 2 points games can be decided by free throw shooting, and MU’s 4 of 9 against Green Bay was two points LESS than expected, so could have meant a shot in overtime to avoid the upset. But in 278 of 409 MU games this century MU’s free throw shooting has been within 2 points either way of average, while in 92 games MU has shot 3 or points better and in just 39 games MU has shot 3 points or more worse than expected. The following are the best 20 free throw shooting days, the worst 10, and the Plus/Minus on how many points MU added or subtracted at the line. I’m sure LSU fans couldn’t believe Davante Gardner hit all 9 of his free throws despite hard fouls, and running the court twice to take on a hard foul at the rim and save a long pass with a ballet move an end from the end line. The fact is when teams see a huge guy step to the line they expect to see a Shaq like miss, but with his nine hits, Davante is clearly the best BIG man at the line in America. Now for the advanced stats guys, I am sure you are running through a bunch of scenarios that would throw off the simple equation of plus-31% for made free throws and minus-69% for missed free throws. It is true that this equation only measures the impact of the free throw make or miss itself and not what happens after. In short, if the free throw made is the front end of a 1-and-1, then the make is actually worth a full point (1.00) because not only have you made the free throw in question (plus 0.31), but you have also given yourself another free throw you would not have had, which results in another 0.69 points on average. My model estimates that about 1 in 10 free throws are the front end of one-and-ones, but will certainly alter that if someone has actual figures. If 10% of all free throws are the front end of one-and-ones, then the overall made free throw would be worth plus-0.38 points. Now on the flip side, if you miss a free throw on which there can be no rebound (technical, first of two or 1st or 2nd of three free throws), then you have cost your team 0.69 points. However, if you miss the front of the one-and-one you have cost yourself not only that free throw (minus .69) but the chance at the 2nd free throw (another 0.69), so the missed front end of a one-and-one actually costs a team 1.38 points. But, when you miss that free throw, or any other free throw that results in a chance at a rebound, then your team has about a 25% chance of grabbing the offensive rebound. Teams grab close to 33% of all offensive rebounds, but I believe it has to be lower on free throws and higher on field goals, so the 25% is an estimate subject to change. The percentages listed in the left column are also all subject to change, and the result of me running models that could be slightly off. There have been just 242 technical fouls called on players so far this season, so I expect only about 3% of all foul shots are the result of technical fouls. The one-and-one front end can obviously only occur on the 7th, 8th or 9th foul of a half and only then if it is NOT an offensive ball possession foul or a shooting foul, so at 0 to 6 per game and even in those cases the 2nd shot of the one-and-one not fitting this category, I believe only about 10% of all free throws made or missed are the front end of a one-and-one. As for the rest of the foul shots and which ones have or do not have rebound opportunities, it looks about even when I run models. When you make the front end you get a 2nd shot that can be rebounded, and the final shot of any shooting foul can be rebounded. The first of two shots cannot be rebounded, but when you get a 3-shot opportunity you have two non-rebound free throws and just one shot that can be rebounded, and then any flagrant has to be added, so when I run simple models it appears that once we get past front ends and technicals, about 44% of shots have a rebound and 43% do not. If these assumptions are correct then a missed free throw on average costs a team about 0.64 points and a made free throw adds about 0.38 points, and even if it turns out a few of the percentages I have are off a bit it’s not going to change either figure much. I'll admit I didn't read all your stats, but I bet you know the answer to this: what do MU fans chant when Gardner is attempts FT's? Hard to tell on TV.